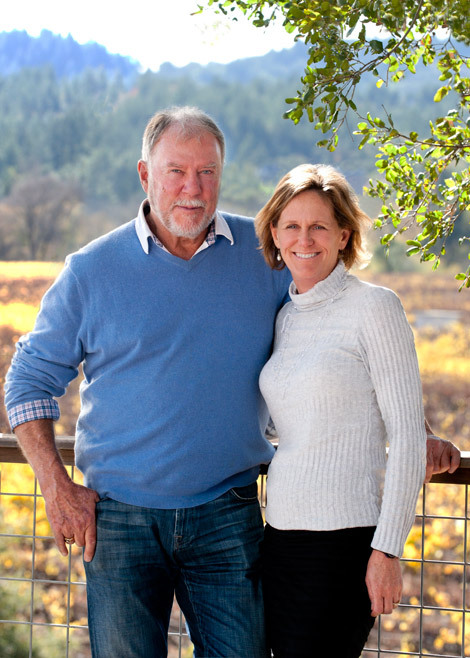 When Ken and Diane Wilson purchased the Soda Rock property in 2000, the charming winery you see today was just a vision in Ken’s imagination. After years of neglect, this local landmark had fallen into serious disrepair. Recognizing the property’s historic value and appreciating the architecture of the stone buildings and water tower, Ken launched Soda Rock’s long-term restoration plan. The same care and attention to detail found in the Soda Rock restoration project is evident at the Wilsons’ other winery properties—deLorimier, Jaxon Keys, Matrix, Mazzocco, Pezzi King. Greenwood Ridge and their namesake Wilson Winery. Their affinity for Sonoma County is reflected their vineyards practices—a commitment to the stewardship and sustainable farming throughout Dry Creek, Alexander and Russian River Valleys. Diane, a native Californian, enjoys her high-energy lifestyle that includes making wine at Wilson, deLorimier, Matrix and Soda Rock and taking an active role in the community. Ken, born and raised in Ontario, Canada, is robust and passionate about his vineyards and wineries. It was Ken’s vision that created the diversity of vineyard sources over the years. These vineyards provide the superb quality fruit that has brought notable recognition to the Wilson Artisan Wineries. Ken and Diane have three children—Sydney, Victoria and Sawyer.